Spring is a time when many sealcoat contractors face the challenge of crack discoloration. Sealcoating in the early spring brings many challenges resulting from cool nights, increased rain and parking lots full of sand and salt from winter maintenance. Although everyone is eager to start the season after a long winter and get the dollars rolling in, some caution should be taken when sealcoating during this time. In the spring, the ground is very wet making it difficult to get work completed. In areas with a high water table, parking lots may stay wet longer than normal, which can create a crack discoloration problem. Crack discoloration is a common issue that arises when water comes up through the pavement where cracks or pavement failure is occurring. As the days get warmer, the sun heats up the pavement and draws the moisture back to the surface. 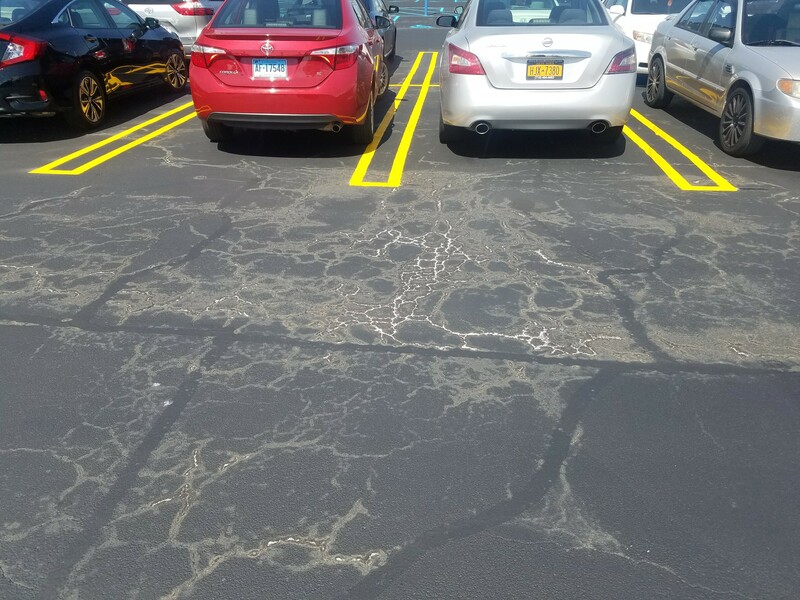 If you sealcoat a parking lot and notice that the cracks, alligatored areas or low spots in the pavement have a discoloration of the sealer, typically brown, that is due to the sealer re-emulsifying. In other words, the sealer reabsorbs the water. Sealer cannot form its film if there is constant water present. The use of additives can help reduce some staining, but remember this is not a sealer problem, this is a water problem. Click here for the complete educational white paper on Crack Discoloration. White coloring may also be seen in the cracks or white staining on the surface due to salts. These salts are from winter deicers resulting from excessive use of salt on parking lots during the winter months or from natural earth salts coming to the surface known as efflorescence. The white stain is most common on pavements composed of limestone materials and is caused by the leaching of limestone dust from the base materials that lie just beneath the blacktop surface. When spring rains seep beneath asphalt, they are later pulled back up to the surface by the sun’s heat. As the water evaporates, it can leave behind a white or yellow mineral deposit in the cracks or on the pavement surface. These stains or deposits are usually washed away over time. Typically by fall, most have disappeared. Disruption of the compacted base materials of an asphalt surface is harmful to the structural value of the pavement. To avoid damage caused by the crack discoloration process, water must be prevented from going underneath the pavement. Developing a plan for crack sealing and patching failed asphalt as well as a careful evaluation of drainage patterns can minimize the appearance of discoloration and the damage that coincides with its development. The last thing a contractor wants is to start sealcoating in the spring and not get paid for a job due to discoloration problems or staining on the pavement. A better approach is to start the season doing repair work to ensure all surfaces are prepared properly and wait for warmer temperatures that are recommended for sealcoating. Education is the key. Even if a customer is pushing to start a job sooner than desired due to the weather conditions, contractors should always talk to the end user about the potential problems that could result in those areas. This method also creates new opportunities to discuss additional work with the customer, such as crack sealing and patching or the benefits of a complete pavement maintenance plan.